Of square section, raised on a splayed foot with an iron-washed foot ring, the body encircled by seven bow-string bands, the straight sides rising to a canted shoulder that continues into the short neck, each corner of the shoulder set with an additional spout, covered with a thick pale grey glaze suffused with a network of dark grey and pale brown crackle. Provenance: Wilbert Smit, Amsterdam, 1984. 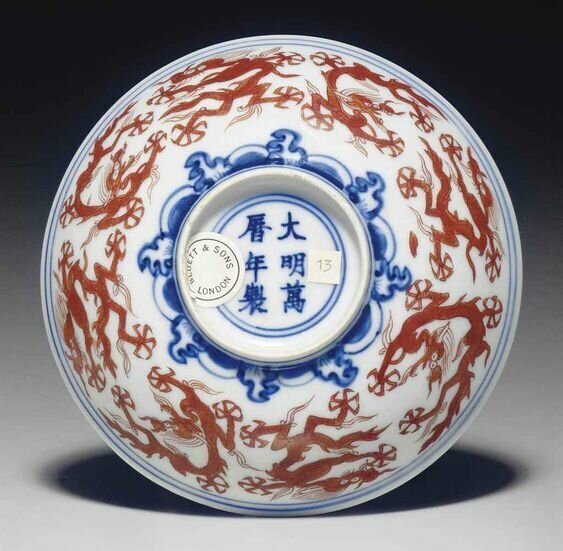 Note: Both the Yongzheng and Qianlong emperors had a great love of antiquity, and wares were made for them that echoed the wares of earlier periods. The shape of the present lot brings to mind the multi-spouted jars of the Song dynasty such as the one illustrated by R. Kerr in Song Dynasty Ceramics, London, 2004. p. 90, pl. 91, which is of circular section, but also has four spouts rising from the shoulder. Vases of this form, which appear to be a marriage between a cong-form vase and the Song multi-spouted jars, first appear in the Yongzheng period. There are examples in celadon and other monochrome glazes. 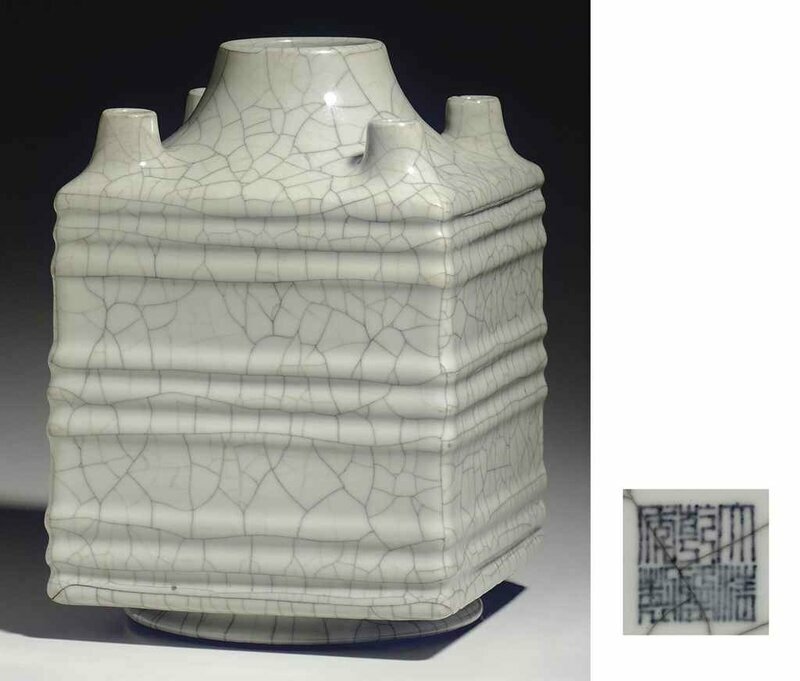 A celadon-glazed example is illustrated in Catalogue of the Special Exhibition of K'ang-Hsi, Yung-Cheng and Ch'ien-Lung Porcelain Ware from the Ch'ing Dynasty in the National Palace Museum, Taipei, 1986, p. 95, no. 64. Vases of this type with Qianlong marks are comparatively rare.